Chinese civilization is said to have started in regions near the Yellow River. Written history can be found as early as the Shang Dynasty, although some ancient texts allude to the existence of the Xia Dynasty before the Shang. Most of the culture, philosophy, and literature in China today have origins in the Zhou Dynasty. 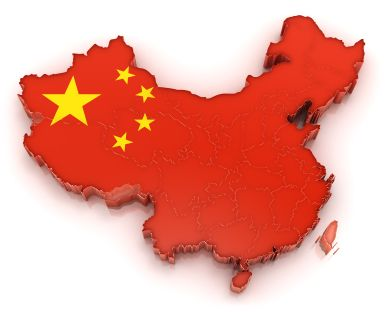 The history of China is characterized by alternating periods of disharmony/warlordism among multiple kingdoms and large, harmonized kingdoms/empires. It is common for dynasties to be led by strong statehood that eventually degrade and become incompetent to rule, creating factions or creating an opening for a new dynasty to take control. The history of the Xia Dynasty is somewhat controversial because of the disagreement as to whether the dynasty actually existed. The basis of its existence lies in the ancient texts Shiji, or Records of the Grand Historian, and the Bamboo Annals written by Sima Qian (145-90 BC). Bronze smelts from the Xia have been discovered in the Henan province that date around 2000 BC. Symbols that have been attributed as antecedent forms to modern Chinese characters have been found on pottery and other crafts from this period. The end of the Xia is said to have come about as an outcome of the Battle of Mingtiao in 1600 BC. The earliest historical record of China has been found in the form of oracle bones, dating back to the 13th century BC, or during the Shang Dynasty. The Shang Dynasty had 31 kings, from King Tang to King Zhou. 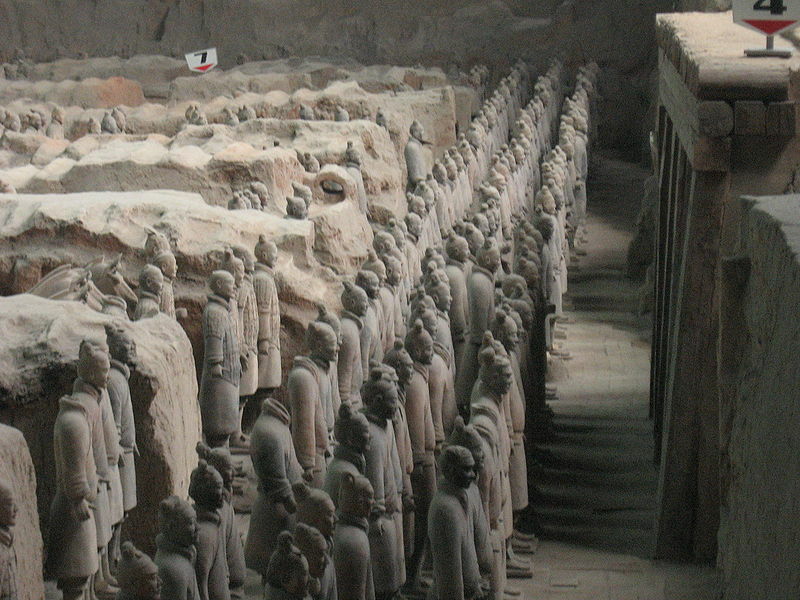 Ancestor worship was quite prevalent during the Shang Dynasty. They also worshipped many gods, including gods of the sky, weather, as well as Shangdi, the god that ruled over the others. The Chinese began to use oracle bones as divination tools around 1500 BC. They believed in a supernatural power called “Tian” (which means Heaven). The Chinese believed that Emperors are chosen by the Mandate of Heaven, and the ones that meet misfortune either lost or never had the favor of Tian. It is said that multiple disasters co-occurring could symbolize the loss of the Mandate of Heaven, which would then transfer to a new ruling house. Political transition in early Chinese history is never a smooth, direct, serial transfer. Earlier Dynasties often coexisted. For example, the early Shang existed at the same time as the Xia, and the later Shang existed concurrently with the early Zhou. The Zhou was the dynasty that lasted the longest in China. At around the 2nd millennium BC, the dynasty emerged from the Yellow River and overran Shang territory. Geographically they were to the west of the Shang. The end of the Shang came when King Wu, head of the Zhou, and the Duke of Zhou, is brother, defeated the Shang in what is known as the Battle of Muye. Wu’s rule was legitimated by calling upon the Mandate of Heaven. The Spring and Autumn Period was a time of political turmoil: Zhou military generals started to usurp power and claimed hegemony. At the same time, the Qin and others from the northwest started invading. The Zhou had to move their capital to Luoyang in the east (hence the second phase of the Zhou Dynasty is often referred to as the Eastern Zhou). Local states started ceding from the Zhou government and forming their own unions. Some officials declared Zhou as their king in name, while others started using royal titles. Further warring after the fracturing of the Zhou in the Spring and Autumn Period resulted in the emergence of seven powerful states that remained until the 5th century BC. The Zhou king still existed as a prominent figure, but possessed little ruling influence over his subjects. The final years of this era consummated in the merging of the seven states under Ying Zheng, the king of Qin. The Qin Dynasty is the beginning of what is referred to as the Imperial Period of China, which would last up to the Qing Dynasty. The new emperor of the Qin would rule for 12 years, during which he managed to gain control over the core of Han Chinese homeland as well as enforce a highly centralized Legalist government. The new Qin capital is located in Xianyang. Legalism emphasized complete compliance to the power of the emperor. While militaristically effective, the doctrine would prove ineffective during times of peace. The emperor ran a brutal campaign to silence political disagreements, burning books and burying scholars. The Qin is known for many contributions to ancient China, including the early establishment of the Great Wall of China, the centralization of government, the development of written language, and the unification of laws. 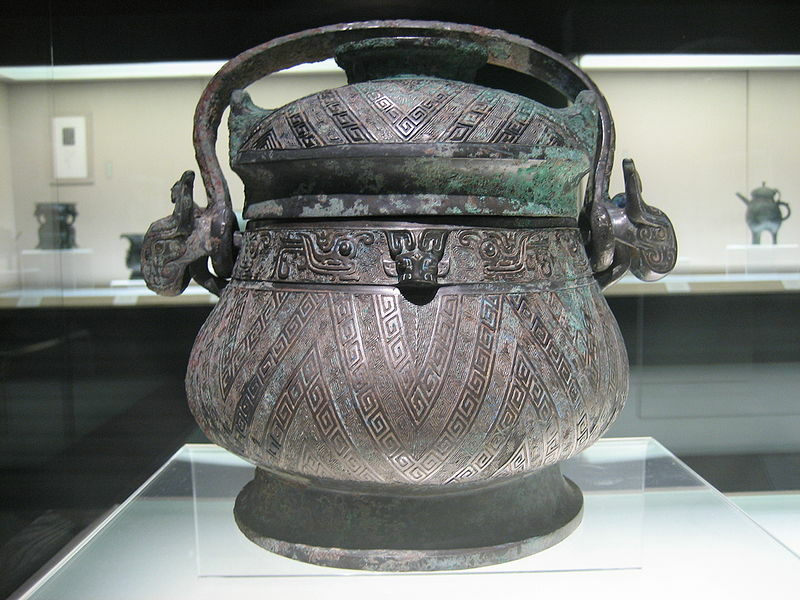 The Han Dynasty came into power in 206 BC, found by Liu Bang. Bang became the emperor in 202 BC. Confucianism became the ruling ideology starting in the Han Dynasty and would remain prominent for the rest of Imperial China. China achieved much advancement in the arts and sciences, and the empire expanded as the Huns were pushed into the steppes. Trade was expanded via the Silk Road between China and the West. The Han Dynasty started to meet difficulties when land acquisitions by elite families started to drain the tax base. A conflict occurred when Wang Mang, a usurper who founded the brief Xin Dynasty started an extensive reform which largely favored peasants. Instability was stirred up with angered landholding families. Later, Emperor Guangwu reestablished the Han Dynasty in Luoyang by gathering the support of wealthy merchant and landholding families. The Han influence started to decline with constant feuding between advisor eunuchs and consort clans. In 184, a great conflict called the Yellow Turban Rebellion occurred, marking the beginning of an era of warlordism. This would mark the discontinuance of the Han Dynasty as China became split by the conflicts between three states vying for dominance. This would come to be known as the Three Kingdoms period. The three states of Dong Wu, Shu Han, and Cao Wei were headed by emperors who claimed succession from the Han Dynasty. This period culminated in a large decentralization of the kind of government that was prevalent during the previous dynasties. Between 220 and 263 can be said to be a period of stable military arrangements, as opposed to the clashing that had been occurring from 184 to 220. The collapse of the stable triple arrangement occurred with the Wei’s destruction of the Shu in 263. And following that, the Jin Dynasty’s crushing of the Wei in 265, and finally the Jin’s destruction of the Wu in 280. The collapse of the Eastern Jin in 420 began an era in which China was represented by many, many dynasties in the north as well as the south. The Chinese Han continued to receive and defend attacks on their northern borders from nomadic tribes, just as the Xianbei. To the south, there were fierce debates in royal courts as to whether Buddhism should be tolerated. Near the end of this era, Buddhists and Taoists became more tolerant of each other. The Sui Dynasty unified China by military force after about 400 years of state disharmony. Though its reign was short, it made great contributions to the Chinese state. The institutions it set up would be adopted by its successors, such as the Tang Dynasty. The Sui is similar to the Qin in that it overused its resources and is mainly associated with the arrogant second Emperor to the extent that its many achievements are understated. The Tang Dynasty took the seat of power in 618. For China, this dynasty was a major age of prosperity and technological advances. Buddhism would become the predominant religion, with its adoption by the royal family and many more lay people. The Tang maintained trade routes to the west and the south. Extensive trade with foreign nations took place, and many foreign merchants came to China. 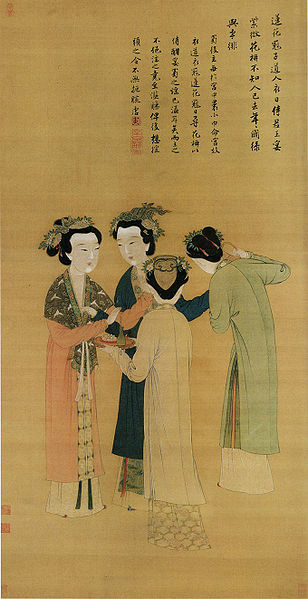 The Tang Dynasty established a land-grant system called the “equal-field system.” Grants of land from the Emperor would be based on family needs, as opposed to family wealth. Prosperity would be enjoyed not for long, because in 860 the Tang Dynasty faced a series of rebellions in China as well as from the kingdom of Nanzhao to the south. A period of political turmoil would ensue. During this period China was in a state of fragmentation, with five regimes rapidly succeeding one another. Ten regimes stabilized during this time, and so the period is referred to as Ten Kingdoms. The Khitan Liao Dynasty ruled over the regions north of China, approximately over Manchuria, modern-day Mongolia, and parts of northern modern China. Eventually, the Jurchen Jin Dynasty would conquer the Liao Dynasty. 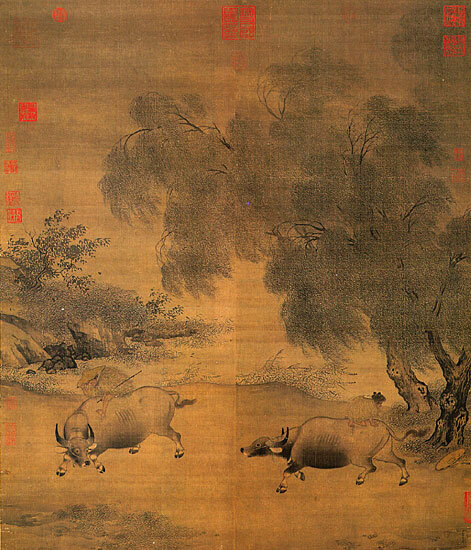 Li Di, Homeward Ox herds in Wind and Rain. The Song Dynasty ruled most of China with its capital in Kaifeng (also known later as Bianjing). Military pressure to the north contributed to the Song’s technological developments, including gunpowder cannons that played a large part in Song naval victories against the Jin. Under the rule of Emperor Renzong, the Song established the first permanent navy and provided the office of Admiral at Dinghai in 1132. In what are the provinces Gansu, Ningxia, and Shaanxi emerged the Western Xia Dynasty. The state suffered destruction at the hands of the Mongols, who founded the Yuan Dynasty. The rising military capacity of Mongols allowed them to invade and conquer the Jurchen Jin Dynasty as well as the Southern Song after. The Yuan Dynasty marked the rule of Mongols over the Chinese. During this era the Mongols were split between this who wished to return to the steppes and those who wanted to adopt Chinese traditions. Kublai Khan, a grandson of Genghis Khan, wished to adopt the Chinese lifestyle, so he created the Yuan Dynasty. During the Yuan Dynasty there was strong sentiment against Mongol rule. Natural disasters in the 1340s paved way for peasant revolts and the Yuan Dynasty was overthrown by the Ming Dynasty in 1368. The population grew and the division of labor became more complex. Large urban centers such as Nanjing and Beijing were established. Industries expanded, most of which were specialized in silk, cotton, paper, and porcelain goods. Despite intellectual introspection typical of the popular neo-Confucianism, Ming China had extensive foreign trade and contacts in the international scene. China’s merchants explored much of the Indian Ocean, reaching as far as East Africa. The Ming Emperor Zhu Yuanzhang, with backgrounds as a peasant, had a vision of China to be a state vested in creating revenues from agriculture, rather than trading, as during the Song and Yuan Dynasties. Ming rulers expropriated land estates established during the Song and Mongol periods. Lands were confiscated and redistributed, and private slavery was strictly not allowed. These new laws were able to contain the worst of poverty from the recent dynasties. The defeat of the Ming came by the hands of the Manchus, who were formerly Jurchen. Ming Emperor Chongzhen committed suicide when Beijing was captured by Li Zicheng’s peasant rebels in 1644. The Qing Dynasty consolidated control over many areas, including those originally under Ming rule. Their sphere of influence grew to Mongolia, Xinjiang, and Tibet. The later years of the Qing Dynasty were met with its incompetence in ruling properly. Evidence that attest to this fact are the many rebellions, such as the Punti-Hakka Clan Wars, Nien Rebellion, Muslim Rebellion, Panthay Rebellion, and Boxer Rebellion as well as the inability to resist unequal treaties with foreign imperial powers. While the Qing Dynasty was able to quell most of the rebellions, they were never able to do so without enormous costs and loss of lives. The Republic of China was established with the fall of the Qing’s very long reign. Sun Yatsen was the mind behind the revolutionary movement that paved way to civil unrests that unseated the Qing. Sun Yatsen became the president of a few southern provinces in 1912, but could not gain more support than the military general Yuan Shikai. In the name of peace, Sun Yatsen handed over the presidency. Yuan Shikai was a corrupt leader who abused his powers. Many groups opposed his rule, including a few military generals who turned a blind eye towards rebellious uprisings. Yuan Shikai stepped down in 1916. In 1919, the Treaty of Versailles imposed unfair terms on China, which resulted in the May Fourth Movement. This resulted in the rejection liberal Western philosophy and an adoption of radical thoughts amongst Chinese intellectuals. In the 1920s Sun Yat-Sen and his forces attempted to unite the fragmented country, and he established an alliance with the Communist Party of China (CPC). Sun died from cancer in 1925, and after him Chiang Kai-shek became the leader of the Nationalist Party, or the Kuomintang (KMT). While the CPC and KMT allied with each other to eliminate Japanese occupation in China during the Sino-Japanese War (1937-1945), they turned on each other after the war due to a failure to compromise. At the end of World War II in 1945, the Japanese ceded Taiwan to the Republic of China, effectively giving Chiang Kai-shek control of Taiwan. When the KMT were defeated by CPC forces in China in 1949, Chiang, his government, his most disciplined troops, KMT officers, and their supporters moved to Taiwan.